When people think of concrete, they usually think of grey, uninspiring slabs. Concrete is certainly not thought of as a decorative material. The reality is, concrete is one of the most versatile decorative materials in existence. There are so many things you can do with it, and it will provide your home with much more than a grey slab. Take a look at why you should be considering concrete for your next home improvement project. Concrete is essentially a blank canvas, for you to create whatever you like. You can use exposed aggregate, stamping, stencilling and colouring, or a combination of all these techniques to replicate sandstone, brick bordering or whatever look you like. Exposed aggregate creates a lovely, textured look, stamping creates textures and patterns in your slab, while stencilling and colouring allow you to create whatever visual you can dream of. Concrete gives you choice, where other materials, such as stone and paving, enforce limits. Concrete is one of the most durable materials available, so when you decorate it, you can get a finished product with aesthetic value, that is also low-maintenance and designed to last. Compare this to stone, wood, and pavers, all of which have an expiry date and require a lot of maintenance to remain in good condition, and the choice is obvious. Decorative concrete saves you money in two ways. Firstly, it is cheaper than other decorative materials, and secondly, it is durable so that it will last longer. Once you’ve installed decorative concrete, it won’t cost you any more money, apart from an occasional re-sealing now and then. If you use techniques such as exposed aggregate and stamping, decorative concrete is non-slip. This makes it an excellent choice for homes with young children or older adults, and it also makes it perfect for wet areas, such as pool surroundings. Concrete is ideal for people with allergies. When polished, concrete can be used for flooring in homes and alfresco areas. Unlike carpet, concrete won’t trigger allergies or allow dust to settle. In addition to the versatility of looks you can achieve with decorative concrete, you’ll also benefit from the flexibility of application. Decorative concrete can be used almost anywhere inside, and outside the home. For example, you could have an exposed aggregate driveway that hides stains and provides a beautiful entrance to your home. You can also use exposed aggregate around your pool while using stamped and stencilled concrete to create a terracotta or sandstone alfresco and outdoor entertaining area. As environmental challenges mount, we all have a responsibility to try and seek out sustainable alternatives to traditional materials. Concrete is this alternative. Its base material limestone is one of the most readily-available materials on earth. Only the amount needed for your project will need to be made, so there is no waste, and the inherent durability of concrete means it will last for decades, without the need to tear it up, replace it and dispose of it. If you live in an area with high-rainfall, or you want rainwater to be dispersed throughout your garden, you should consider pervious concrete. 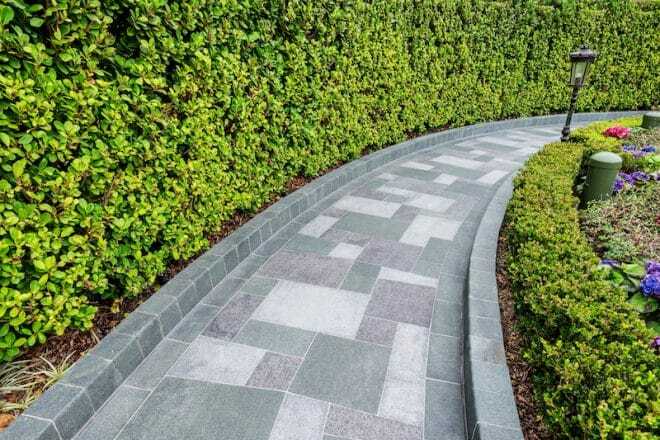 Pervious concrete can be decorated like regular concrete, expect it contains sponge-like sections of voids that allow for water to be passed through and into the soil. Whatever home improvement project you have planned, decorative concrete should feature heavily. As you can see, it is one of those rare materials that has advantages from a number of perspectives. What other material offers you complete control over design and application, low-maintenance and durability, affordability and sustainability? For too long, concrete has been considered a bland material the base of a house but never the star. It’s time to shift that perspective because decorative concrete offers up too many advantages to be ignored in favour of traditional materials. Everlast Services have been preparing and pouring concrete for over 20-years. We love concrete, and we encourage all of our customers to consider it as an option for their home improvement project. The success of all concrete solutions depends on the pour, so make sure you have the experts at Everlast on hand for your decorative concrete project.